The Gallery will be CLOSED Saturday, February 9 – Wednesday, February 21 for installation of the next exhibition. “Residual Membranes” is an exhibition of intermedia sculptural fiberworks by Portland-based artist Amanda Triplett. Made from salvaged textiles, Amanda’s work reimagines the internal landscape of the body and its processes. This exhibition consists of wall-hung sculptural objects, cascading fiber installations, video projection, and an ongoing performance and installation piece entitled Exuviation. 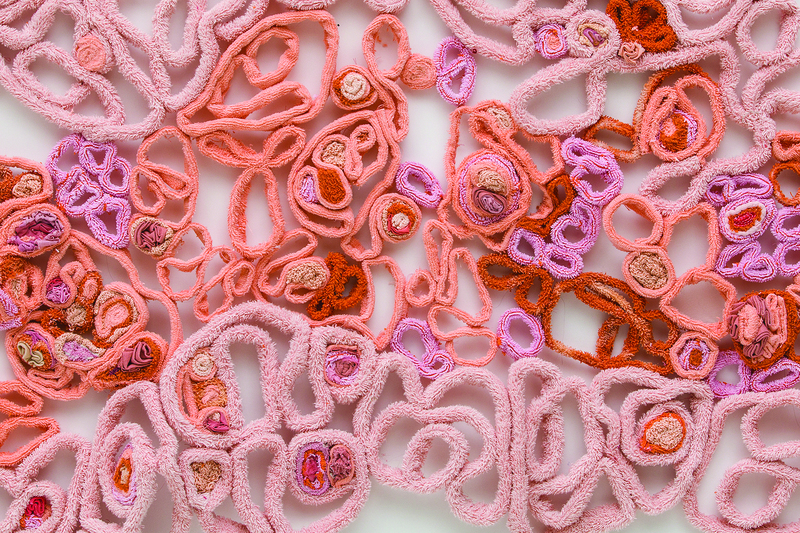 Making art in the space where fine art and craftwork intersect, Amanda manipulates, layers, and embroiders salvaged fibers into abstractions of biology. She creates sculptural and installation works about human relationship to biological narratives. Working with materials gleaned from thrift stores, garbage piles and free boxes, Amanda selects well-worn items of intimacy like garments, towels, and linens. Taking scissors, needle and thread to worn and weather textiles, Amanda’s process of making facilitates a conversation between our socially contracted second skins (clothing, etc.) and the emotionality of our inner landscape. Oozing, soft, supple, fibrous, and organic, these works ask how we reconcile our fleshy masses with culturally-designated body narratives. Reflecting Pool is a video installation that speaks to the struggle of self-love. Projecting video onto a pool made from recycled fiber, the imagery of the video explores the artist’s own experience with self love and bodily acceptance as a moving image struggles in a mix of water and fiber to breathe and speak of love. For the performance, Exuviation, the artist will enter the space and inhabit the installation, altering the piece through a molting process of cutting and slow-stitch sewing. Through the course of the exhibit, the installation will be transformed by the artist’s molting process. The artist will perform 2 times a week for the duration of the exhibition.